Qualiform is your source for rubber parts. We offer quality at an affordable price. We custom design the items you need using compression molding, custom transfer molding, custom rubber injection molding, and rubber to metal bonding. You’ll benefit from our years of experience. We take the time to understand the rubber products you need and can help you design the best possible product to suit your needs. We take pride in what we do, which starts with gaining a clear understanding of your needs. Then we design a process for creating that unique product. We always use quality materials and ensure every product is uniform and suited for your needs. We strive to exceed customer expectations and outperform other rubber companies. We also provide custom compounds that are developed for each client’s specific application. 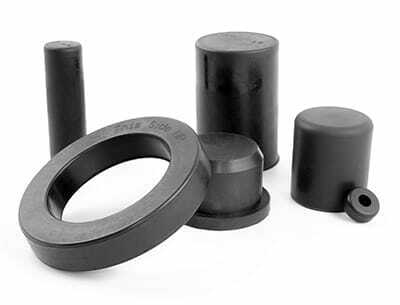 Our knowledgeable engineering staff can help you with development and design to suit your rubber parts and grommet manufacturing needs. Gaskets and seals are vital components for many businesses and they are used in many applications. You need seals and gaskets to prevent seepage of air and moisture. We are your source of manufactured gaskets, seals, and other rubber parts. We offer both static and rubber seals. If you are wondering how an experienced, professional rubber products manufacturer can help your business, contact Qualiform today to learn more.